One can argue that Captain Kirk's Starship Enterprise slogan "Space, The Final Frontier," is probably as close to the perfect analogy for space planning and management as one can find. Like the Enterprise, we have seen continuous changes in the exploration of space. Higher education space planning and management is the new frontier. Although higher education in the United States is more than three centuries old, space planning and management has only been a serious practice in the last 20 to 25 years. Colleges and universities have invested resources and time developing processes for planning and management, including ways to inventory, classify, and create databases for their space information. The next frontier will focus on how to manage and adapt current space for tomorrow’s needs, and create new spaces that support ever-changing program needs. Colleges and Universities must create space planning and management systems that are process oriented and data driven. Effective space planning and management systems need to address a more diverse set of issues than ever before. It is no longer simply a concern of the amount of space we have at an institution. In addition, an understanding of space quality, functionality, and proper adjacencies must be taken into account. Reducing the costs associated with space and increasing space utilization is quickly becoming a major focus. Traditionally, departments and programs in higher educational have viewed the space as a "free good" (a commodity to which they have access without accountability or cost). Space carries substantial on-going costs required to operate, maintain, modernize and equip. Space is a scarce and valuable resource on most college and university campuses, and must be managed as such. One can thank the Information Age for providing tools and opportunities to better manage our plan and manage our facilities. While the economy limits financial resources, our spaces are adversely affected, subsequently affecting our institutions’ programs. Part of the success of a program relies on having the proper physical environment in which to operate. Because of this, our campuses are finally placing an emphasis on not only the amount of space a program needs, but also the quality, functionality, accessibility, and cost-effectiveness of that space. The twenty-first century is producing new strategic approaches in space planning and management. A new focus on providing an atmosphere aligned with ever-changing, diverse program needs is taking shape. No longer will planning be around the "box" or "room" as in the past. Rather, planning will develop a "place" that is flexible and continually adaptable to the program's needs. Spaces will be cost-effective and well utilized. There will be more three-dimensional planning and less square-feet planning than in the past. New concepts must embrace a more dynamic and less statistical approach for space planning and management to be successful. Amount or quantity of the existing space—does the program have enough space? Condition or quality of the space—is the space in good condition? Effectiveness or functionality—does the design or layout meet the program needs? Location of the space—is the space adjacent to other appropriate programs? Cyberspace—is it technologically satisfactory, with enough space for bandwidth, storage, wireless lines of sight, etc.? The above five components exist not only within buildings but also outside buildings and underground. The first component of space is the amount or quantity of space. Space projections determine how much space a program needs. This space projection is used to create a space inventory to determine the deficit or surplus of the program on the campus as a whole. This is considered the quantitative element of space planning. An analysis is usually done for renovation or new projects (program plans) and campus master plans. The second component in space planning is the condition or quality of space. A program may have enough space, but it may be old, failing, or unsafe. Many campuses perform building facilities audits or condition analysis, but only a few are beginning to develop space condition audits. The second component in space planning is the condition or quality of space. A program may have enough space, but it may be old, failing, or unsafe. Many campuses perform building facilities audits or condition analysis, but only a few are beginning to develop space condition audits. Component three is space effectiveness or functionality. A program may have enough space, it may be high quality, but it may be functionally obsolete. How many times have we built buildings only to renovate them in the next few years? With ever-changing teaching methods and new technologies, a program's space must be flexible in supporting its current and future pedagogical needs. The fourth component is the location of space. A "space" may be large enough, be in great condition, and be designed appropriately, but located in the correct place. A space may be too far from programs it needs to be near to or too close to those it should be removed from. Campuses have grown haphazardly over the years. Programs have taken advantage of using space only because it may have been available, but it may be be in the best location on campus. Campuses need to develop comprehensive space plans, to include appropriate adjacencies, in order to effectively accommodate the needs of its programs. Many argue of a fifth component in space planning, the cyberspace. This is the space needed to support information technology, data transfer, communication, and data storage. Many believe that bricks and mortar are becoming less and less important because the instruction, equipment, and technologies within the space is more valuable. We must include bandwidth, sight lines for wireless technology, and other technology spaces as our fifth component of space management. Campuses must be aware of the advances in technology and be prepared to provide appropriate space for these advances. Space management is complicated by the fact that outdoor space should also be considered. Building space is only a small percentage of all the space on most campuses. Programs such as athletics, housing, student affairs, special events, and the community have long used the outdoor space on campuses. Outdoor space is very important to academic programs as well. The campus site is used by many academic programs for instructional or research purposes. Plant managers and engineers have long argued that we do not plan our underground resources very well. As we continue to change, relocate, and add to our infrastructure, we must plan appropriate space for such. In addition to typical infrastructure needs are spaces for access tunnels, habitable spaces and corridors, storage systems for fuel and water, and other space-needy systems. Many older campuses have a “spaghetti factory“ of utilities that are unorganized and difficult to manage. Many times it becomes impossible to place new buildings or meet site needs atop an unorganized infrastructure. Without proper space planning below grade, campuses typically spend an exorbitant amount of money over the years relocating utilities. all space needs to be considered: indoor, outdoor, and underground. A pioneering effort in this area, and still the standard reference in terms of defining and coding types of space, is the Higher Education Facilities Inventory and Classification Manual (FICM), published by the National Center for Education Statistics (NCES). This manual was originally published in 1973 and most recently revised in 2006. The FICM provides definitions of buildings, room use, and classification taxonomy. The FICM is widely accepted as a standard set of guidelines for maintaining campus information. The following definitions are offered to help clarify those in the FICM: http://nces.ed.gov/pubs2006/ficm/content.asp?ContentType=Section&chapter=4§ion=3. Assignable square feet (ASF) refers to the space that is typically used by a specific program or department. It is commonly referred to as the usable or needed space for programs to operate within. It is simply the area in which one can place built-in or movable furnishings and equipment. Non-assignable square feet (NASF) refers to spaces that are necessary for the general operation of a building. Many spaces are shared and cannot be considered assignable. Non-assignable spaces are those that connect assignable spaces, are needed for assignable space to work, and are the lifelines of a building. Some examples include hallways, stairways, restrooms, mechanical and electrical rooms, custodial closets, the building structure, and other building support spaces. Net square feet (NSF) can be both assignable and non-assignable. It is typically the total space dedicated to a specific use or owner. It is the sum of all areas on all floors of a building, plus that portion of space necessary for the general operation of a building. Net Square Feet is typically used when leasing or renting space to or from a private enterprise. Gross square feet (GSF) refers to the total amount of space that makes up a building, including the assignable and non-assignable space. It is the sum of all areas on all floors of a building included within the outside faces of its exterior walls. This includes floor penetration areas for circulation and shaft areas that connect one floor to another. It is the single most influential factor in maintaining and operating facilities in higher education. Space utilization refers to how often a space is used during a given period. It can be measured by total hours of use or as a percentage of use during a specified time frame. For example, many classroom studies are done based on a weekly time frame since it is the most consistent measurement, regardless of the course. In other instances, one may look at utilization for a specific semester or even year. This is typically the case in special-use or general-use spaces. Space efficiency is commonly referred to the occupancy rate a space has when it is in use. It is typically used when determining instructional or laboratory space needs or when measuring how well current spaces are being occupied. Many times, a space is scheduled and in use but only partially filled. Besides controllable use, rooms may have maximum capacities due to egress requirements, or there may be specified limits due to maximum enrollments for a course or other activity. Stations refer to individual places or areas in which an activity occurs. Stations are seats in a classroom, desks in an office, chairs in a library, counter space or fume hoods in a laboratory, beds in a residence hall, seats in a dining room, and so on. On any college or university campus, the above space definitions also apply to two basic types of funding classifications: nonrevenue-generating space and revenue-generating space. The distinction between them is important from a space management perspective because typically each has different methodologies and measures for assessing performance and efficiency. A third component of institutional space is research space. This is a hybrid of the institution in that research serves a primary academic mission, but has potential independent funding sources. Campuses use a variety of tools to monitor quality, quantity, allocation, and utilization of space. Most are database applications that allow the campus to maintain accurate, up-to-date, documentation that defines the vital statistics of institutional fixed assets related to all space on campus. These applications are a typical series of databases that track the key characteristics of an institution as a whole. This includes its property, facilities (buildings and other structures), rooms, and equipment. An optimal campus system would consist of electronic databases, containing quantitative and qualitative information that can communicate with other campus databases. Best systems have “links” between databases such as classroom scheduling software, human resources databases, and other people- or use-related information. Most databases are enhanced when interfaced with a computer-aided design (CAD) system and/or geographic information systems (GIS) that graphically delineate land parcel attributes, site information, and building floor plans. There are no perfect products for campus inventories or fixed asset databases. What a campus uses to manage its information is typically determined by numerous issues such as cost, ability to communicate with existing software programs, ease of use, and anything pertinent to that specific campus. The key is to use programs that allow the campus to manage its data on its own and not rely on a third party for reports or to manipulate the data. Typically, a variety of software is required because each type of information is unique. Some software may be graphical in nature, while other software may be alphanumeric. It is very important to ensure that each database uses common tags, codes, or references so that data can be shared between software and studies performed accordingly. Meaningful benchmarks and a common language define and allow the assessment of campus facilities. This allows institutions to evaluate programs, share information, review policies and procedures, and analyze other data. A common classification system not only helps space managers and university administrators internally, but also allows institutions to share and compare data. The most common classification system is the Higher Education Facilities Inventory and Classification Manual (FICM), published by NCES. This manual was originally published in 1973 and most recently revised in 2006. It provides definitions of buildings, room use, and classification taxonomy. Figure 3. What kind of space is the student lounge at Swarthmore College? As useful as these room use codes are, particularly in establishing common reference points for cross-institutional analysis and information exchange, they are by no means exhaustive. Additional sub-codes will routinely be required as an institution's space management needs become more complex and demand the identification of specialized space. However, all additions to the master list must cross-reference or be clearly associated with the institutional system of choice. Campuses allocate space to people and programs in a variety of ways. Many have staff located in a central office (academic or administrative) who are responsible for space allocation and others allow departments or units to administer their own space. How space is allocated is driven by the campus administrative structure and the culture of the specific college or university. It is imperative that an institution maintains good data regarding space allocation. The capital investment to create space, the ongoing operating costs of maintenance, and the periodic renewal and replacement costs of upgrading is extremely expensive. Depending on the space type, this can run anywhere from $10 to upwards of $25 per square foot per year (not including renewal or renovation costs). Since many occupants are never impacted by these costs, they tend to perceive space as a “free” resource. Regardless of the software used, the most important aspect of any space inventory is its accuracy. Too many times campuses rely on surveys, part-time students, or program personnel to update the data. This seldom works. There are numerous reasons why, but the most prevalent reason is a lack of training and ownership of the task. Other reasons are the time commitment involved, the interest in the project, and the understanding of the importance of the information. For a space inventory to be as accurate as possible, someone trained in the process is important for consistency in the evaluation of the campus. A campus space inventory or database is continually in a state of modification. Revisions are generated primarily by new construction, renovation, and space reassignments. Consequently, verification of databases, via regularly scheduled and periodic audits, are needed. These verifications will correct and update the data system, provide the basis for calculating space needs, and fulfill reporting requirements. Timing is usually another concern. Since data is continually being updated, a report from one week will differ from a report in another week. This may make data look inaccurate or inconsistent. It is important that data updates be communicated to all users of the space data in order to review the use and intent of the information prior to providing reports. Many campuses are now considering a "census date" in which the space information for reporting purposes uses a specific date as a snapshot for its data. The data as of this date is used for a planning and reporting purpose unless there is a specific need for "up-to-the-minute" information. Typically, the period shortly after the fall semester course schedule add/drop is chosen as the census date. There is a perception that maintaining a campus space inventory is space management. Considering the five types of space described in the space definitions (amount, condition, effectiveness, location, and cyber), one can easily see that it is much more than maintaining an inventory or detailed fixed asset database. Although the inventory database is a foundation for many decisions, universities cannot survive on their buildings alone. To be prepared and properly manage their space, campuses should begin to measure, understand, and plan for all five space types. To date, many campuses spend an exorbitant amount of energy on the amount of space a program needs. However, some campuses lack the planning and analysis for the condition, proper adjacencies, design, and technology of their space. If all five aspects are continually considered, campuses will properly manage their space and provide a continuous plan to ensure that their programs have the proper “place” to orchestrate services. When looking at the three centuries of development in higher education in the United States, it is apparent that the evolution of the facilities services department over the past 50 years is helping campuses meet their mission. One of the newest businesses within facilities services is space management, and particularly the specific element within space management of space planning. Although it is one of the newest services, space planning and management may be the one service that can have the biggest impact on the success of a campus. Changes facing space management on campuses revolve around three major areas. The first is a programmatic issue. For years, campuses have forced professors to operate in a series of “boxes” defined by those who know little about the business of academics and research. Faculty members have been forced to move from room to room, box to box, to deliver their program. It is time to challenge the campus environment and what should drive that environment. It is no longer acceptable to provide space that is not programmatically driven and designed by the programs themselves. It is time to rethink the campus environment. The first challenge is the overall planning process within the college or university and the link between academia and facilities with the intent to utilize space most efficiently. Figure 4. What if we combined the boxes? A second issue facing space management is the actual exploration of appropriate space planning. What is space planning? What has it been traditionally? What should be considered? Campuses need to think beyond the square foot and begin to think three-dimensionally about their one consistent need: change in space usage. Campuses need to consider the questions of quality vs. quantity and space use vs. ownership. Consider the five basic aspects of space and the importance of each aspect to programs. Challenge campus practices with new measurables and metrics used in planning and analyzing space needs to better align space with higher education's ever-changing programs. Continually strive to be program driven, not space driven. Another space management issue is the impact of technology and the information age. Knowledge is the ability to obtain, process, and disseminate information. Knowledge is the foundation of the success of society. Higher education must be prepared to take advantage of the new tools that are now available, as well as those that will soon be available. Technology is ever-changing and is a tool for learning. Campuses must take advantage of these technological advances and be prepared to support them. Space planning is involved in all aspects of planning on a campus, from long-range master planning to project planning. Although there are various levels of detail for each aspect, space planning allows campuses to link the needs associated with near-term and long-term issues. Since facility resources are typically scarce, investments in space, whether renovated or new, will impact our successors. 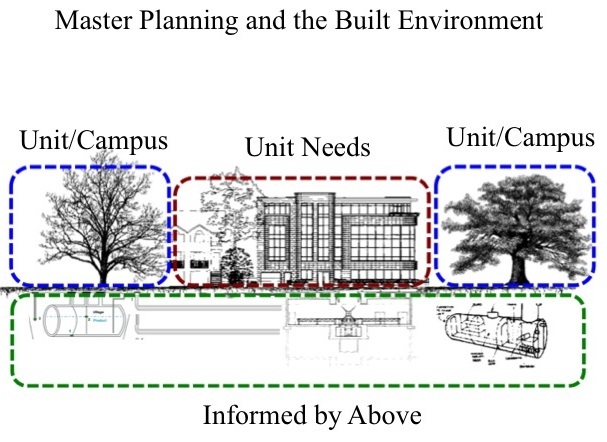 Campuses must always consider the long-range issues (master planning) associated with all space changes! Remember all those “temporary” barracks which are still in use 50 years later. Never underestimate the impact of today’s decisions on future generations. Many campuses are just beginning to take the space planning and management business serious. Most keep track of what they have (space inventories), but many struggle with the overall planning and management of their space. It takes personnel and resources to accomplish this, both of which are currently hard to come by. This is a concern considering that some campuses have more than 20 million square feet of space on a single site. Campus buildings are the largest asset and must be managed properly. Building operating and maintenance costs approach building replacement values within a 10 to 15-year period. If campuses are not managing this asset, they could very well be spending money unwisely. The costs of facilities are rising at an alarming rate every year. Some of these costs are for maintaining and operating, providing utilities, and employing personnel providing services associated with the facilities. Also, the costs to build facilities in higher education are typically higher than in private industry (refer to “Why Building Costs So Much in Higher Education” by Don Guckert and Jeri King). This article alludes to numerous reasons why facilities cost more in higher education, most of which are based on the university’s mission, the expected longevity of the facility, and the types of programs which are supported. This results in facilities of higher value and a larger economic resource or asset, which must be managed well. Without proper space planning, the investments made in our facilities today may not be well utilized. Another important impact factor in why we must manage our space more effectively is the cost of technology. Technologies have a major impact on the types and perhaps even the number of facilities being built. Hybrid teaching models are showing a growing need to combine traditional face-to-face teaching methods with newer learning applications that may not require direct contact. These hybrid models bring with them the need for new types of spaces. These spaces are used to manage information that is delivered via Web-based instruction or other technology-driven methods. Spaces are also used to develop, produce, and deliver the curriculum. The more flexible the building space, the better. Although flexible space may be more expensive as an initial investment, the life cycle is more cost-effective. Space uses and needs change continuously. Consider how many uses may occur over a life of a 50-year old plus building. Programs come and go. Spaces have to be changed for new programs. Many times, the space cannot support the new program without major renovations. Therefore, providing flexible space initially is an investment in the long run. Figure 6. A football stadium may be used only six times a year! There is something known as the football field syndrome. Consider the campus facilities that are utilized very seldom, such as the football stadium. Colleges and universities all over the country are trying to figure out ways to utilize these facilities more than six to eight times per year for football games. Using these facilities for athletic practice, special events, combined community use, and other events are requiring campuses to plan and manage space differently. Campuses are studying ways to reduce operating costs associated with specific programs, especially those which require expensive facilities. . This concept should be applied to all types of space on a campus, not just the football field. Consider that 75 to 80 percent of the space on larger campuses is associated with activities other than academic. Campuses are beginning to use space information to budget capital and physical needs for various programs. Space has an incredible impact on a program’s ability to obtain and maintain accreditation in its associated discipline. Many times, these programmatic deficiencies are caused by changes in the program. Likely reasons for programmatic deficiencies are enrollment growth, pedagogical changes, demographics, and scheduling changes. These changes will impact space needs and the associated budgets needed to maintain and operate those spaces. There may be a need for a different budget (more or less) for renovations, relocations, or simply new furnishings and equipment. How can campuses maintain their buildings properly if they don’t know what their program’s needs are? What is the future of a campus' facilities? How many times have we upgraded a facility only to find out a few years later that it should have been done differently? How many times are faulty facilities simply replaced? When campuses develop space planning programs, it is important to consider the needs over at least the next decade, if not longer. Flexiblity, adaptability, and the unknown are all planning variables that must be addressed in the planning process by adding these issues as programming elements. Always considering the five elements of space planning discussed earlier will improve the planning process and begin to marry capital, maintenance, modernization, and repair/replacement programs in a way that is program driven. Considering total space needs when establishing capital plans is important. Any space analysis must consider the level of detail that is necessary. Space assessments are done for a variety of reasons. They may be done for master planning purposes, utilization assessments, programming and project planning, reporting, and many other reasons. Each space analysis has a specific amount of detail that is required to do the analysis correctly. Master plans many times use general guidelines, rules of thumbs, peer analysis, etc. to get a magnitude of need for long-range planning purposes. Being accurate to the closest 500 square foot is appropriate. If the institution is preparing for a design (programming) then the level of detail is typically assessed room-by-room, down to the nearest single square foot. Space needs are driven by people and how they operate. However, this simple approach becomes quite complicated when actually defining or measuring the space needs for our patrons. There are unlimited ways to manipulate the thousands of variables used to analyze space needs. Some are simple, like office and administrative spaces. Others, like intensive research space or collaborative shared multipurpose space, are not. Regardless, it is important to understand that people’s operating practices drive space needs. Faculty, staff, students, and visitors are the drivers. The better campuses understand those involved, the better they can plan for and manage the needed space. A typical shortcoming on some campuses is that human resources (people data) and facilities data do not use consistent coding and can not communicate with each other. Many times, department codes or other data sets vary so much that the data cannot be consolidated well. For instance, facilities may not have a department code for a department that does not have space. A personnel database may not have the department code for a certain space that may not have occupants. It is always important to have a data management system that truly considers both data sets (people and facilities)and ensure there is one common set of department or program code for each space. The code should be a campus standard. A facilities organization should never manipulate these codes or adjust the codes based on space use. Time is probably one of the largest variables with which space planners and space management offices struggle. For years, studies have recommended ways to formulate how to capture the reuse of spaces and when those spaces reach a capacity based on their use. 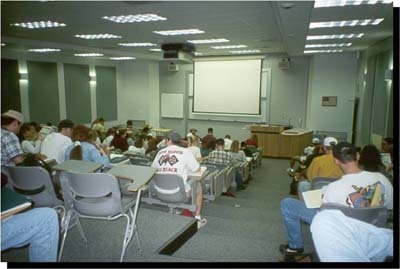 For example, classrooms can be used by a variety of programs. When do they become overused? What is a good schedule so they are used efficiently, yet still leave time for class preparation, cleaning, test taking, having larger meetings, and sharing them with the community? Campus planners spend a lot of time and effort on classrooms and laboratories, their time dependency, and trying to make them as efficient as possible. Some of the most important spaces on campuses are classrooms and laboratories, even though classrooms may make up as little as 5 to 10 percent of many campuses' space inventories and laboratories may only be another 10 percent. Other spaces, in addition to instructional spaces, may also be time dependent. Athletic spaces and fields are a perfect example, typically being used by numerous programs such as physical education, student organizations, recreational sports, club sports, intramural sports, the community, summer camps, and so on. There continues to be pressure on campuses to use these spaces in the evenings and on weekends. This impacts security issues, lighting issues, mechanical and electrical use, operational costs, maintenance, and the simple length of time these spaces can survive. The credit hour is used quite often in evaluating instructional space. This is a relatively good measure for determining the number of students a program is supporting. Planners use credit hour information to determine the amount of contact hours that are necessary to support a class. The ratio of credits to contact hours varies from program to program, year to year, and course to course. Many campuses actually measure the contact hours a program supports. This is the best variable to use if this data is available. The value and use of the credit hour and contact hour in evaluating instructional space is a change that is likely to happen in the near future. This will make it more challenging for planners when measuring space needs for instruction. The traditional credit hour per contact hour ratio will likely change as more team learning and project approaches are used. It is likely a student will get valued credits to go through a program, and yet a university may not classify whether those credits are earned in a classroom or in a laboratory. Why? Pedagogy is changing. New learning environments are more integrated, and there are hybrids of space types. It will be difficult to classify time in the traditional “classroom” or “laboratory” setting. The instructor will soon have the ability to develop a program that meets the needs of the students, as opposed to having to force the program into this traditional credit hour classification system. and spaces needed to support thos models, for curriculum development. Hybrid courses and/or integrated learning spaces should also be utilized at higher rates and be more efficient. It is likely that the same spaces will be open at night with graduate-level support to help undergraduate students. For example, graduate students could help undergraduates with projects or resources needed for a class. The traditional 8:00 a.m. to 5:00 p.m. school hours is beginning to become extinct on most campuses. As campuses increase their partnerships with the private sector and the business community, universities will need to improve utilization of space on the weekends and evenings. Obviously, the business partners typically run their offices from 8:00 a.m. to 5:00 p.m., so campuses and their programs may need to be more available in nontraditional hours. The use of space in the evenings will increase as a result. Most of the other space planning variables are dependent on the activity within the space being considered. The less a space is “shared” by multiple users, the more it is customized for a specific use. A high percentage of campus space fits in this category, so each activity requires its own planning variables amd space metrics. As campuses try to become more flexible and create multi-use spaces, new planning variables and metrics will be necessary to determine space needs and accountability. Space guidelines can be used to help evaluate space use. These guidelines specify the aggregate square footage appropriate for each type of program activity and serve as a guide both in planning for new space and assessing the efficiency of existing space distribution. Space planning guidelines are not absolute design standards, but they should reflect the uniqueness of the institution and they should be reasonable and supported by the administration. They must reflect a good understanding of the academic function and should be to be applied at the broadest institutional level. Over the years, a variety of higher education councils and national organizations have published space guidelines and design standards. There is no single recognized reference. Frequently cited systems are those published by the Western Interstate Commission on Higher Education, the Council for Educational Facility Planners International, and many by the State Post-Secondary Higher Education Commission. Published benchmarks can provide a reference point, but for most institutions there is no universal set of guidelines that are applicable. Accordingly, many institutions develop their own space profile. This profile must factor in both the particular program requirements and unique facility requirements. Examples would be taking significant stock of older, less efficient buildings; space-intensive programs such as architecture or studio art; space needs associated with graduate students; emeritus faculty or faculty with multiple department appointments; and state guidelines or requirements if the institution is a public college or university. Criteria is established for each of the above so a campus program can determine what values and metrics are best for each space type. Good quality studies also have the ability to place a weight (or an importance) factor on each criteria. Not all space attributes are equal, especially as to the affect the attribute has on the program.Criteria is established for each of the above so a campus program can determine what values and metrics are best for each space type. Good quality studies also have the ability to place a weight (or an importance) factor on each criteria. Not all space attributes are equal, especially as to the affect the attribute has on the program. Productivity can be measured in a variety of ways. In the private sector, financial return is a common measure—if a project meets a target rate of return, then it is productive for the owners or investors. In an institutional setting where profit is not the driving factor and where many buildings do not generate revenue streams of their own, other methods are required for assessing productivity. The concept of charging for space is one such method that is gaining popularity as a means to provide incentives for optimizing the use of available space. Usually this is best be done as part of a comprehensive, responsibility-centered budgeting process. Storage is one example of a space type that institutions can easily lose control of. Obsolete or surplus equipment, archival files, and underutilized collections are typically stored for long periods of time. Many times however, items are stored for longer than necessary and/or are in dispersed locations. Items of little value are taking up valuable space. Charging even nominal amounts will impel managers to carefully analyze storage retention in regard to space. Institutions can improve efficiency by involving the user in an attempt to lower overhead costs. This can be accomplished with a monitored budgeting system for items such as utilities or maintenance costs. The savings incurred through lowering overhead can be applied to other program needs by the department, including the possibility of an increase in discretionary program spending. If additional costs are required, it suggests that further exploration is required to determine whether the current allocation is justifiable or whether the department can reasonably meet its needs in less space. This would then free up space for other campus needs. The campus should also determine if the space is inefficiently configured or is in an older building with more generous offices than current standards would suggest. In either of the above alternatives, there may be additional costs associated with administering the system. However, these costs can be offset by reducing the need to construct new facilities or by generating funds. Utilization patterns by time of day- Those charged with classroom scheduling may have an intuitive feel about peak and downtimes in room utilization. A formal analysis objectifies this and quantifies the benefits of increasing utilization during less popular scheduling periods. Example: In an institution with a target room utilization rate of 66 percent, a time-of-day utilization analysis reveals 20 percent utilization during the 8:00 a.m. time block each day and 25 percent overall utilization on Fridays. With this information, a space manager calculates that within the 66 percent target utilization rate, two additional classes per room can be scheduled during these time periods. Utilization patterns by academic department or school- This type of analysis permits the scheduling pattern of each academic unit to be tested against a university-developed standard. This would be needed when individual departments or schools do their own scheduling and control their own blocks of rooms. Example: A room utilization analysis reveals that departmentally scheduled classrooms are used 30 percent of the week, whereas registrar-controlled classrooms are used 75 percent of the week. This would suggest a significant opportunity for increasing the productivity of departmentally controlled classrooms. Seat utilization patterns- Analyzing the percentage of seats used on a class-by-class basis reveals how well the size and mix of classrooms and seminar rooms meet enrollment patterns. Example: A seat utilization analysis reveals average seat occupancy in smaller classrooms (those with fewer than 30 seats) to be 93 percent, compared with 40 percent occupancy in larger rooms (those with more than 30 seats). This indicates that a number of small classes are being scheduled in large rooms and suggests that the institution may have a greater need for smaller classrooms. Further analysis reveals opportunities for subdividing some of the larger rooms into smaller rooms, improving the overall mix and potentially freeing up underutilized, large classrooms for other uses. Instructional space evaluation can be a highly useful tool in keeping classroom spaces filled productively. Done properly and consistently, these analyses bring objectivity to the evaluation and discussion of classroom use. For example, many institutions may assign classrooms based on the maximum capacity established by a faculty member. Yet an analysis of actual enrollment patterns may reveal that the capacity limit is never achieved, thus leaving many seats unutilized. Institutions may find it helpful to seek outside assistance in undertaking the initial analysis. Thereafter, the space manager can assume responsibility for generating follow-up analyses on a periodic basis and working with the chief academic officer to ensure that instructional space use is efficient. Being careful with enrollment caps- Unrealistic enrollment caps sometimes cause courses to compete among each other for certain sizes and locations of rooms. Registrars commonly use the practice of "rolling over" course registration from semester to semester and even year to year. Part of the data being rolled over includes course capacities set by the professor or department. Often, this number is not reviewed from year to year, so the scheduling of classrooms is driven by old information. Typically, when course enrollments are going up, the registrar is notified accordingly. However, many times when enrollments are dropping the update is forgotten, resulting in a misrepresentation of the number of stations necessary for a classroom request. The result is underutilized classrooms or instructional labs. As part of space utilization and management, institutions should set policies or procedures to continually update the enrollment capacities. Library Space- No single campus building is evolving faster than the library. As the standard medium of knowledge transmission moves from printed text to electronic, the amount and type of shelving systems are being questioned. No productivity model is likely to remain useful in this changing environment. The fundamental nature of the library is shifting from a centralized institution to a decentralized service organization. The "library" will no longer mean a monolithic building in which books and periodicals are stored and circulated, although such a structure will remain a campus fixture far into the future. Instead, this facility will be supplemented by an information services organization, which will likely be a group of professionals and specialized computer hardware distributed throughout the campus. The quality of an institution's information services will no longer be measured in linear feet of stacks, millions of books, or thousands of journal subscriptions. Rather, it will be measured in the number of collections to which the institution has immediate computerized access and the professional skill of its staff in retrieving information from those collections. The need for collection space for book stacks and periodical storage currently assumed by many space guidelines will not occur because institutions will share their resources. New space will instead accommodate people, not books. 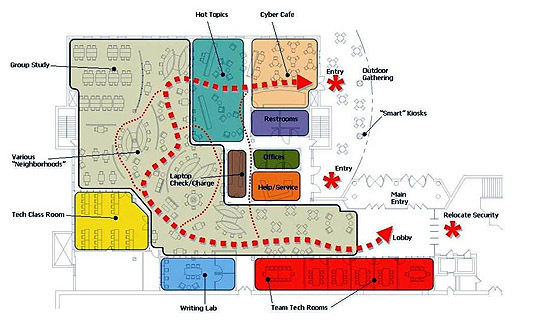 The integrated computer laboratory, media center, academic support centers, reading rooms, social centers, project centers and makers spaces will dominate the physical form of the library building. The stacks will be integrated into the entire design. Figure 8. Libraries are moving materials into more efficient environments to provide proper climate control and access. The space is being repurposed for additional study, learning centers, and improved service space. Special-Purpose Spaces and Non-assignable Areas- These areas are used in support of the institution's mission, but are areas for which measures of productivity cannot be devised systematically. An example might be a facilities shop or an art studio. Although it may not be possible to identify specific productivity targets, full costs (both capital and operating) associated with special-purpose spaces can and should be identified. Based on objective cost data, qualitative judgments can then be made about the need and value to the institution of this space. Research Space- In a research university, research space is often assigned to individual faculty or research teams on the basis of projects funded through sponsored or contract research. Because of its revenue-generating capacity, one approach to evaluating research space is in terms of financial productivity specifically and the annual volume of sponsored or contract research dollars per square foot. With this measure, a space manager can perform several comparative analyses to shed light on research space productivity. Comparisons may be drawn among institutions, departments, and research teams with similar research space requirements (e.g., all wet-laboratory disciplines or all office-oriented research disciplines). Where data for other institutions or national norms are readily available, comparisons may also be drawn between similar departments inter-institutionally, comparing an institution's biology department with biology departments having similar characteristics in other institutions. Where research space is in short supply, an institution may want to consider setting productivity benchmarks and allocating space to research teams whose sponsored research volumes meet these marks. Example: A university has had numerous requests for additional wet-laboratory space from various research teams. On analysis of sponsored research dollars per square foot in its "wet-laboratory" departments, it finds the average annual sponsored research dollars per square foot to be $45. Three of the research teams are in the $5 to $12 range. The university may decide to provide these teams with a grace period (e.g., two to three years) to increase sponsored research activity to a certain target. Those not meeting this target would then forfeit their space to other teams with greater sponsored research funding. Auxiliary Space- Many of an institution's auxiliary spaces are revenue generating, most notably housing, food service, bookstore, and retail space. Because these spaces are revenue generators, their productivity can be easily evaluated with financial measures. However, it is important to recognize that financial performance will vary by type of facility and by institutional objectives. Student housing, for example, should generally be break-even space or better, although in rare cases an institution may decide for programmatic reasons that some subsidization may be warranted. Auxiliaries contracted to outside vendors should produce some level of positive return to an institution. Example: An institution is contemplating development of new housing. As a first step in the planning process, it undertakes a market and financial feasibility study to determine whether an economically viable project is possible. The feasibility study includes an evaluation of demand and rent tolerance, competitive context assessment of the local market and peer institutions, and testing of student interest in particular configurations. Following market research, an integrated financial model is developed that includes rents and other revenue sources, operating expenses, and capital budget requirements for the proposed project. The institution uses this model to balance program goals and financial requirements until a "break-even or better" project is achieved. Example: An institution that runs its own bookstore operation is trying to evaluate the effectiveness of the operation. Knowing that the private sector has a well-developed industry in contract bookstore management, it decides to use the private sector as a benchmark of performance. A term sheet is assembled identifying the bookstore's current and anticipated requirements for services. This is then offered to bookstore vendors to solicit preliminary information regarding potential return to the institution from "privatizing" the bookstore operation. Comparing this information against the institution's current internal operation, the competitiveness of an internally run shop and the opportunities for improving financial return by privatizing can be evaluated. If the evaluation results in the conclusion that privatizing is a promising option, the institution is then in a position to put together a formal request for proposals and solicit detailed proposals from vendors. Hybrid Spaces- Hybrid spaces have a mix of revenue-generating and non-revenue generating activity, such as student unions. In such facilities, the productivity of each activity should be measured according to the appropriate standard. For instance, food service would be measured against financial performance or student service spaces. Many Institutions perform studies to compare themselves with their peer institutions. It is essential that when doing any kind of comparison, the data is consistent amongst each institution. Campuses collect and maintain their space inventories in a variety of ways. Each campus has a unique way of defining spaces and collecting, maintaining, and analyzing data. Like space inventories and databases, programs also differ from campus to campus. Not all programs are alike because they have the same title. It is imperative that when comparing space issues amongst campuses data variables are consistent. It is also important to keep in mind that peer comparisons do not take into account whether the peer schools are using their space well or not. Too many times, schools place too much emphasis on peer comparisons and not enough on a good space analysis based on how your institution operates. Every school is unique. A facility’s condition assessment is an inspection that identifies and categorizes the deferred maintenance and capital renewal requirements necessary to restore each campus building to its initial condition. Information resulting from these assessments has a variety of applications, especially when coordinated with financial, maintenance, and operations data. At the strategic level, integrated data can be useful in evaluating whether to renovate existing space or to build new space. In the day-to-day management of facilities, an assessment of campus building and room condition can be helpful in planning, budgeting, maintenance, repair, and compliance projects. It is critical that this comprehensive stewardship occur in conjunction with major capital programming. Facilities condition assessments are described in further detail in APPA BOK Section 2. Over the years, universities have become very complex organizations—much like mini-cities. However, universities are unique in that each has a specific purpose or mission. Campuses have grown into large businesses that must support their patrons with a comprehensive and supportive environment. Because of this, the sheer size of a campus demands a variety of expertise to support its educational aspirations. Each of these businesses tend to become increasingly isolated as the campus grows in size. Some campus faculty and staff are reaching tens of thousands of employees. Universities and colleges are becoming more and more aware of the problems associated with large businesses. In the planning arena specifically, a renewed synergy is taking shape to address the gaps amongst campus operations. To simplify the major elements of the successful campus, consider looking at your college or university in four basic arenas: (1) the programs that your institution presents to its patrons, (2) the people who orchestrate or benefit from those programs, (3) the resources necessary to run the programs, and (4) the physical environment or the places in which the programs occur. Outside forces such as the university budget support all aspects of the planning chain. In each of these arenas, numerous programs are needed to operate the campus. The newest of these businesses are those associated with the physical environment, mainly the facilities organizations and specifically the planning offices within facilities. This viewpoint may bring some clarity to a very complex business and help improve understanding of the variety of roles needed to make an institution successful. For almost three centuries, much of the planning effort has been spent focusing on programs and the academic vitality of the university mission. It was not until the past two decades that the focus has shifted to linking the budget process with the strategic process. Strategic plans are now incorporating budget considerations. The budget processes are becoming more integrated into the programs and becoming an everyday way of doing business. Faculty and staff are being required to be very involved and more accountable for their programs and budgets. In some cases students and even the private sector are engaged. But what about the place? What about the environment in which this all happens? Planning in the twenty-first century will likely bring a realization that the physical environment must be included in the overall planning process of a campus. It must no longer be left to the facilities experts to assume the planning of a campus on their own. At a growing rate, studies continually indicate that new students are choosing campuses based on the physical environment. Yet, campuses often leave the facility experts in limbo, unconnected to the overall planning process. Facilities management and the institution must work together to combine their expertise. In addition, facilities management must continue to work on ways in which they can better understand the programs and be a more integral part of the academic, research, auxiliary, and outreach business planning processes. Space planning processes can be used to help build partnerships and relationships between facilities functions and programs. Space issues (along with parking issues) are the Death Star in the personal “Star Wars” battles of many campus facilities. Space is the one thing faculty, students, and staff call “theirs.” It doesn't matter that no one owns the space that they use. The perception is that it is “my space.” It will be protected at all costs and people will do whatever it takes to get more, a concept that goes back to medieval times, however is ever so real in most institutions. This may be a little harsh, but it is true to a great extent. In the past, many have been involved in moving walls six inches because someone else's office space was bigger than their office space. Have we lost track of our fundamentals? Turf wars exist for a variety of reasons, but a major factor is that space is the one element that allows people to feel connected to a place—in this instance, a part-owner of the campus. It defines their “place” in the institution. Another perception of space is that it equates to program and political success (including program diversity, political will, influence, and autonomy). Space is emphasized in student/faculty recruitment and retention. For years, facilities planners have fought this ownership issue. Campuses must consider new approaches and stop fighting the perception of ownership. Work with it, use it as a tool. Why not let the ownership issues be the catalyst to a new approach? Use the energy to build a process and complete the chain of space management. For example, facilities planners can work more closely on a department-controlled classroom renovation project to assist in layout, design, and funding in exchange for broader scheduling of its use. The partnerships will help address dozens of space issues that face a campus on a daily basis, while improving the planning process for master planning and other longer-term needs. This changing space management approach must be addressed slowly, implementing early and short success stories. Simply reorganizing a long-term space management practice may be catastrophic. Develop a plan for change and implement it slowly. As discussed, the higher education culture is a very sensitive one. Take the departmentally owned classrooms as an example. Would you just demand they be placed under the registrar's control? That would be a very poor decision with dire consequences. On the other hand, would a department likely trade the costs of running its classrooms for the ability to hire more faculty? Don't the costs of "ownership" align with budget? Releasing the departmental classroom to the registrar with an assurance of first preference frees departmental budgets for other uses. These rooms can then be better utilized, equipped consistent with campus standards, and placed in a renewal cycle supported by university budgets. This is one small example of numerous opportunities in the space planning and management world that can only be achieved through partnering. Many space inventories are very large and include numerous fields within the database. At especially busy times, years may go by without appropriate updates. Campuses should not take this lightly. More and more program and facility decisions are dependent on good space data. Many campuses even get funded according to their space and ultimately per the space inventory. Assuring the data is continually improved is vital. Create quality checks, review data collection practices, verify coding is consistent, assure occupant codes are official, and maintain data. A reference manual should be created for the space inventory. When managing space, and providing reports to a variety of patrons, it is important to be as consistent as possible. Most campuses will update and make changes to their space information on a continuous basis. They may be done every week, once a year, or sporadically throughout the year, but updates are essential. Be sure to manage data distribution consistently. Consider establishing periodic dates within a semester to distribute information as opposed to sending out reports from “live” data sets. Much like reporting for Integrated Postsecondary Education Data (IPED’s) or any other annually report in higher education, a campus should consider a “census” date for space reporting and only when necessary, provide up-to-the-minute reports on the latest space data. This assures the data is consistent throughout the year. Although the information age is changing the physical environment on a campus, one of the biggest reasons for doing a better job of space planning is to change the way one looks at facilities. 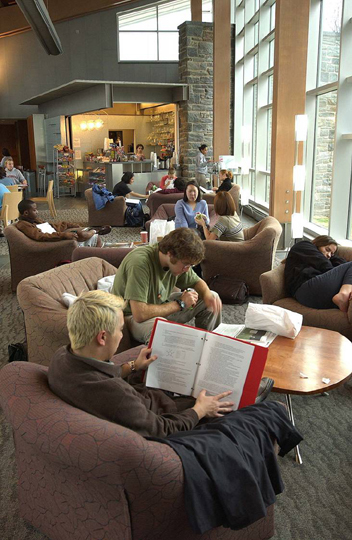 For years, institutions of higher education have planned spaces on a room-by-room basis. Faculty and students have moved from box to box depending on what they want to do. If they want to do instructional work, they move to a box we call the classroom. If they want to do something on a computer, they move to another box. If they want to do laboratory work or get hands-on experience, they move to another box. To meet in an office is another box. To meet as a group in a conference center or seminar would be another box. Campuses have boxes to support these boxes, and it becomes box after box after box. Campuses have actually developed facilities in a way that forces faculty and programmers to create curriculum around spaces and boxes. The above describes a facilities-driven approach that is not very flexible, adaptable, or even considerate of our programs. Why not consider a new approach? 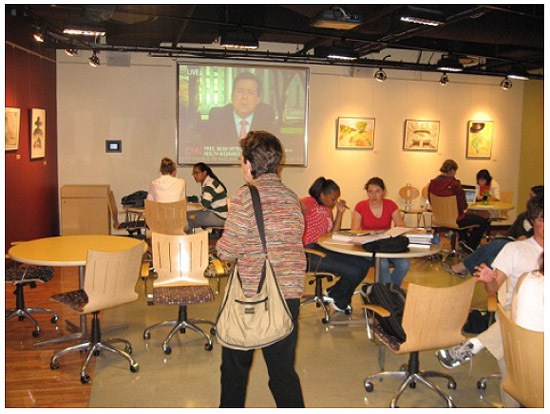 Why not consider academic spaces as theaters for learning and places of change? Create environments that are flexible, multipurpose, multi-use, and adaptable. Environments should be able to change the theatrical set at any time. Maybe the level of flexibility or the amount of time it takes to change a space is the new planning variable. The advent of integrated learning centers is one way to address the traditional space limitations. As we change from a teaching and lecturing paradigm to an active learning one, spaces must change accordingly. There is a growing need to provide instructional spaces that promote multitasking, teaming, and active learning methods. Programs now employ a variety of activities including any combination of lecture, lab work, project teaming, computer analysis, meetings, administrative work, video conferencing, and resource centers. A "class" may need to be in lecture mode for a few minutes, perform a short lab test, simulate another test on a computer, show the results to someone via Internet, combine the data with another test, present the results to another team, document the results, print the material, and finally add the product to a resource center for later use. New learning spaces are providing additional benefits. Many times, these spaces improve the awareness and the presence of their programs. They are very active and energetic. Lower division students can see how the applications of their theory and basic skills courses are applied in upper division courses and applications. Integrated spaces also tend to reduce the ownership issues that arise with custom spaces. When multiple activities are shared by a variety of programs and students, the tendency to adopt or label a specific program as one's "own" begins to fade. Too many times space issues that arise during the design or renovation phases of a project are due to poor planning. As new programs come along, campuses must realize programs change. Space exists longer than programs. This makes adaptability an extremely important consideration. Space plans must look beyond current program occupants. It is simply not good enough to prepare space for today's occupants. Space must be prepared for tomorrow's occupants as well. Today’s programs require new, innovative, flexible, spaces that support numerous pedagogies. This challenges the traditional planning procedures, methods, operations, and guidelines. Active multipurpose spaces are going to be more important as we build partnerships among the private sector, institutions, and the community. Places that are adaptable and flexible, promoting multitasking and collaborating, are in demand. Team learning promotes project collaborations and interdisciplinary teaming, simulating "real world" experiences. This team learning model will reduce the effectiveness of our traditional boxes. This does not say that some of the spaces, such as lecture halls, will be eliminated. However, the amounts, types, and numbers of these spaces are continuously changing. the size and use of space throughout the day. Flexible spaces bring on mechanical, electrical, technological, and utility concerns. Many of these spaces require different amounts of air and power, complicated by the fact that they are open, flexible spaces. This will be a major challenge for facilities planners and space planners. Utility distribution in and out of facilities is driven by our space plans. As we plan for new types of space, so must we for system distribution, maintenance, and operation. Traditional space planning processes have focused almost solely on statistics and databases. Programming is considered by many to be the calculations that project a campus' space needs. This is simply not true. Space planning is becoming more complicated, yet more subjective. Campuses are finding that planning is less about a small improvement in efficiency, and more about quality and redesign of what already exists. Regardless of the reason, it is clear the variables driving space needs are programmatic. Actual users, administration, and a set of longer range planning needs (flexibility and adaptability) should collectively determine space issues. Those who actually live in, own, and operate spaces should plan for them. Faculty, program directors, staff, and administrators need to be more involved in that planning process. The planning management office has a responsibility to orchestrate the process, but the planning variables and metrics used to analyze the space needs should include the input of all involved. There is a perception that the amount of space campuses need to operate is going down on a per student basis. More effective use of space, teaching in remote areas using technology, taking courses online, sharing information across technology, and other improved operating procedures lead to this assumption. On the contrary, although some spaces are becoming more efficient, other new spaces are in demand to support activities for different needs. The need for lecture space may be declining, yet the need for larger spaces for hands-on team learning is rising. The need for large desktops is declining, but the need for battery-charging stations and on-the-go printing is rising. The space to store hard copy library materials is declining but the need for more collaborative meeting space is rising. The list goes on. To date, it appears that although there is a major shift in the type of space needs, the total amount needed per student or faculty/staff is growing slightly due to increased collaboration and program activity. traditional lecture halls are one-dimensional and are becoming less popular. Much like parking, space is one of the most sensitive issues on a campus. Since programs do not pay for their space directly, many do not see the benefit of using their space efficiently. Space is expensive, however these costs are hidden from the academic programs. It is difficult to get space when needed or redistribute space when it makes sense. For these, and numerous other reasons, many campuses see a "hoarding" of space, making it difficult to provide space to those who need it most. Those who use the space are typically not those who maintain and operate it. This disconnect results in inadequately assigned, designed, maintained, or equipped space. Many campuses are considering new ways to minimize inadequacies in space management by getting program users, typically academic programs, more involved. When there is the perception that space is free, programs will not be interested in change. All programs should be held accountable, and one way to improve the accountability is to develop a stronger business and space use model. Campuses are considering internal lease programs where all programs theoretically lease space back from the campus. This is a hybrid of the private industry and leasing space. Concepts being explored would place facilities organizations as "space managers" and landlords. They would be funded through payments made by programs. Programs are given a budget (which was once part of the facilities management budget) to pay for their space. Various spaces would differ in their lease payment, depending on the actual operating cost. Wet labs cost more than offices, so the lease cost would be adjusted accordingly. Programs would only pay for what they use, giving them an incentive to release what they do not need. Campuses are considering ways to help improve space utilization and the perceptions of space ownership through increased partnership between programs and facility departments. This cooperation will be very important as we see operating costs rising at an alarming rate. Currently, a high percentage of operating costs are based upon the building configuration including walls, doors, heating, mechanical, and electrical systems. The more technology employed, the more the operating costs. Technology and furnishings are, in some cases, becoming more important than the building itself. This alone may double operating costs within the next 15 to 20 years. As demands in the future require campuses to be thinking about space that is more flexible and adaptable, they also need to start reconsidering planning, design, and construction. A concept that considers attention is to combine flexibility with sound long-term investment strategies. It is a schools best interest to develop buildings and spaces that last in perpetuity if at all possible, however, programs are continuously changing. Can campuses do both? Can institutions build 100-year buildings that can change quickly? Why not? It is very possible to construct building shells and cores that can last a century, with interiors intended to be replaced every 10-20 year. Staff at the University of Colorado have been considering this for the past few years. This concept should be taken seriously in higher education. It is a way to balance the longevity of campus environments with the flexibility and adaptability of space. In many cases, universities are seeing research and academic endeavors melding together in programs. An increase in private sector partnerships, and other program changes are demanding we develop space that can change and adapt quickly. Campus administrations and state bureaucracies need to be comfortable with more innovative, less prescriptive ways, to plan and develop future facilities. Traditional, statistically-oriented planning models that give out space on a program-by-program basis are quickly becoming obsolete. Future space planning considerations will likely begin planning space using a three dimensional perspective, potentially planning by the cubic foot instead of the square foot. The shape and/or height of space is becoming increasingly more important than just the floor area. Most functionally obsolete or non-flexible space is due to short-term limited thinking. So often, planning is done by floor area with little consideration regarding the entire volume of space. Vertical space considerations should be taken into account at all times, especially when considering future, unknown possible uses. The role of technology is placing a very high emphasis on how successful many spaces are. The tools within a space are becoming as important as the bricks and mortar that house them. Several factors make a space important. These include the technology or how a space is equipped, how flexible the space is, and where the space is located. The actual room or box is becoming less a focus than how the space can operate. A testament to this is the growing investments being made in new projects and renovations for technology, equipment, furnishings and operations. As a percentage of the project budget, these costs are beginning to match that of the actual building. Figure 11. 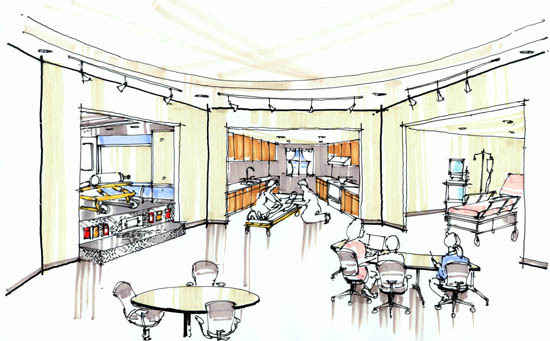 Emory's Cox Center lets the students create their own spaces. Advances in technology, internet speeds, wireless technologies, and programming, will continue to impact how a space needs to operate to support our programs. As these improvements are integrated into our instruction, research, and operations, the need to access and manipulate instantaneous information is going to paramount to our success. Whether delivered by wired or wireless technology is becoming less an issue. What happens after the information is obtained is our next challenge. With the abundance of information, seemingly unlimited data, and complicated tasks to solve, there is an increasing need to provide technology rich space that supports collaboration and teaming, much like project centers in private practice. New learning spaces are no longer driven by the credit hour. There will be less dependency on having access to the traditional classroom, laboratory, or office like the past 300 years. The advent of Massive Open Online Courses (MOOC’s) are just the beginning. Imagine the potential of the next decade or two and the impact on our campus built environment. Our focus as space planners, managers, and facilities experts must advance to accommodate the ever-changing program means and methods. Campuses are very aware that the better we plan and prepare our physical resources, the more likely our programs can succeed. Physical resources and programs go hand in hand. Quality programs cannot survive without quality facilities. To be proactive, some campuses are developing space models that focus on a program driven, data justified process of evaluating space for all programs on campus. They are being created as a team effort amongst academic/program personnel, university staff, and professionals, The modeling efforts help build partnerships among the facilities, academic, campus programs, and budget planning processes. They provide the ability to test any number of strategic planning scenarios and can identify the associated facility impacts they may have on the physical environment. Understanding the facilities needs associated with our program aspirations ahead of making decisions will provide campus leadership with vital information needed to be successful. So much of our spaces on campus are functionally obsolete. With rapidly changing programs and operating taxonomies, planners must find ways to be more aggressive regarding space planning, assessment, and ultimately transformation. Facilities management, administration, and staff need to partner with their customers in order to plan for the most effective use of the space within an institution. Creative options need to be explored to make space cost-effective for an institution. Technological advances are making campuses rethink the traditional uses of spaces and how that space should be utilized now and in the future. Higher Education is in a major transformation. Are we ready for the changes and are we able to accommodate these changes? Besio, Melanie and Jeffery Tilman. "Space Management." APPA Body of Knowledge, 3rd Edition. University of Virginia; Gall Biddison and Thomas Hier, Biddison-Hier Consultants to Higher Education. Council of Educational Facility Planners, International. (2006). Space Planning for Institutions of Higher Education. Columbus, OH. IES National Center for Educational Statistics. 1990 K Street, NW, Washington, DC 20006. (202) 502-7300. JBA Incorporated, Specializing in Higher Education Facilities Planning. Joe Bilotta, 7512 Tamarisk Drive, Fort Collins, CO 80528. (970) 988-6059. joe@jba1.com. U.S. Department of Education, National Center for Education Statistics. 2006. Postsecondary Education Facilities Inventory and Classification Manual (FICM): 2006 Edition (NCES 2006-160). Washington, DC. Western Interstate Commission on Higher Education. 3035 Center Green Drive, Suite 200, Boulder, CO 80301-2204. Except as permitted under copyright law, no part of this chapter may be reproduced, stored in a retrieval system, distributed, or transmitted in any form or by any means - electronic, mechanical, photocopying, recording, or otherwise - without the prior written permission of APPA. Please use the Print PDF button to print this Chapter. You must be a logged into the APPA site and an APPA member to print or create a PDF of this BOK chapter.